Can’t find a dental expert who can meet your standards of care in the Conejo Valley or Ventura area? Get treatment from some of the best dentists in the state of California at Carson & Carson, DDS. We are just a few miles from most areas of Ventura County. With 2 convenient locations throughout Oxnard and Camarillo, Carson & Carson makes going to the dentist a quick & easy trip. Our dental offices accept most forms of dental insurance and our Oxnard office location is available 24 hours a day for dental emergencies 1-805-983-0717. At our Oxnard Dental Office, we provide patients with the best quality care in Cosmetic, Pediatric and Implant dentistry. 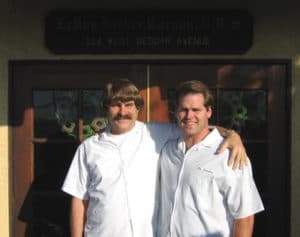 Our dental experts Dr. Leroy Carson & Dr. Derek Carson have an incredible passion for caring for teeth, and together, have over 60 years of combined experience in dentistry. Many affordable dental services available at Carson & Carson, DDS in Oxnard, California. Since 1970, we have forged a trusted quality of dental service in Oxnard and Ventura County that our patients have come to rely on when they have a dental emergency. At Carson & Carson, we are dedicated to bringing you the highest quality in treatment plans that are the individually tailored to each specific case. Feel comfortable knowing that your teeth are in some of the most experienced hands in the Oxnard area. We treat patients of all ages with the latest dental technology to create a painless & cost-effective treatment plan to fit your dental needs. From Cosmetic & Implant Dentistry for adults to Orthodontics and IV Sedation dentistry for kids, our expert dental team in Oxnard has the experience and technology to help you establish good oral hygiene for years to come. With a lab technician on site, we can provide precision crafted dental aesthetics which are made in our own laboratory within just minutes of your visit. At Carson & Carson, we accept many dental insurance providers and plans. Call us today at 1-805-983-0717 to find out why we’re one of the finest dental establishments in all of Oxnard and Ventura County! Browse one of our many reviews to get an idea of what past patients have experienced.